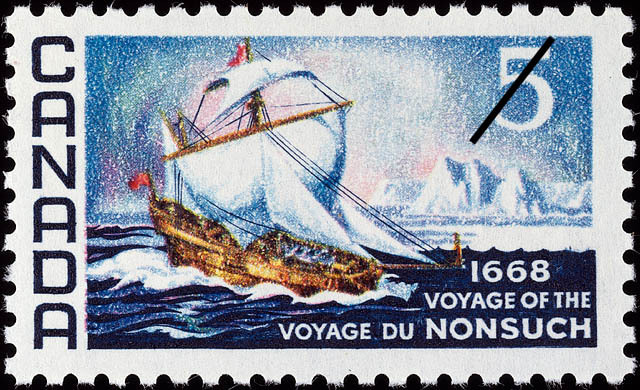 The value of a Voyage of the Nonsuch, 1668 - 5 cents 1968 stamp depends on several factors such as quality and wear, supply and demand, rarity, finish and more. Values in the section are based on the market, trends, auctions and recognized books, publications and catalogs. This section also includes information on errors and varieties and characteristics. A perilous four month voyage into norther seas which has been credited with opening Canada's West through the fur trade is recalled by this Canada Post Office Commemorative stamp. Sailing from Gravesend, England, on the June 3, 1668, the tiny 43 ton 36 foot ketch Nonsuch heaved to on September 29 in James Bay at the mouth of a waterway which the adventurers christened Rupert River. Their point of landing was to become the site of Charles Fort which, in turn, became Rupert's House. It was here that the newcomers from the old world met the primitive Cree Indians who displayed a significant lack of hostility. Obliged to winter in the unfamiliar harsh northern environment, their experience and discoveries were subsequently recorded in the words: "- they report the natives to be civil and say Beaver is Very Plenty". The Nonsuch and her crew, commanded by a New-Englander from Boston, Captain Zacharish Gillam, returned to London in October 1669 with a rich cargo fo prime furs; it was this success which led Prince Rupert and 17 associates to obtain from Charles II their incorporation as The Governor and Company of Adventurers of England trading into Hudson's Bay. The Charter, a lengthy document of some 6,500 words, has been referred to by historians as the most far-reaching commercial document in British history. It had not been intended that the one vessel would be alone in the venture; in fact, a second ketch, the Eaglet, had sailed in company with the Nonsuch. The Eaglet, 54 tons and 40 feet in length, under the command of Captain William Stannard, was forced back by storms leaving the smaller vessel to persevere alone. Sponsors of the plan had originally laid down the concept that, if success was achieved, the two Captains, Stannard and Gillam, would exchange ships for the return voyage. Prior to 1668, 2 men, Médard Chouart, Sieur des Groseilliers and Pierre Esprit Radisson, had perceived the potential fur trade which could be tapped by explorations through northern waterways. In the furtherance of their plan, the two made their way to Europe where, it is recorded, they were put into touch with Prince Rupert, cousin of Charles II. Rupert recognized the feasibility of a plan to substitute a summer voyage for a year in the wilderness, thereby, according to some writers, earning the right to be regarded as the virtual patron saint of the Northwest Territories. King Charles' enthusiasm for the venture is apparent in his decision to make available a naval ketch, the Eaglet; assigned to travel with this vessel was Radisson, Groseilliers joined the Captain and crew aboard the Nonsuch, a former naval vessel which had been sold in 1667 and now made available by her new owner, Sir William Warren. We are told, in the wording of yesteryear, that the Eaglet turned back in the early stages of the voyage because she was: "-by reasons of the deepness of her Wast unable to endure the violent Stormes they mett with all".